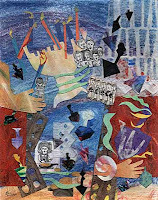 “The Joy of Judaism The Work of Flora Rosefsky”, is featured at the Katz Family Mainstreet Gallery at The Marcus Jewish Community Center of Atlanta (MJCCA). October 9 , 2012 through January 31, 2013. Paper cutout collage and drawings. Gallery open during regular MJCCA hours. Images courtesy of the artist. All rights reserved. "Beneath Thy Wings", 22 x29", Collage: paper cutout, gouache, 2012. Flora is also participating in Interpretations: Contemporary Jewish Art in Chattanooga, TN. October 16-November 30, 2012 Artist Reception: Thursday, October 25, 2012, 5-8pm. Two exhibits, Interpretations: Contemporary Jewish Art and Windows of Identity, will be open to the public at the Jewish Cultural Center from October 22 through November 30, 2012. Each exhibit proclaims the unique visual dimensions of religion. A reception to meet the regional artists, and view both exhibits will take place on Thursday, October 25 at 5:30 p.m. at the Jewish Cultural Center, 5461 North Terrace Road, Chattanooga, Tennessee. Interpretations: Contemporary Jewish Art is mixed media exhibit which includes concrete sculptures such as Hebrew Letter Eggs, by Chattanooga artist kem alexander, multi-media paper works and handmade artist books such as a Box for Queen Esther by South Carolina artist Jane (Sheindal) Muller, and collage paper cuts such asSabbath by Atlanta artist Flora Rosefsky. 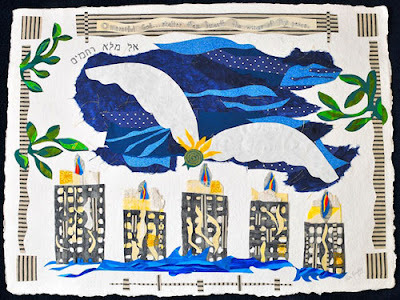 The exhibit includes the artists’ interpretations of Biblical stories in Hebrew, Yiddish and English as well as the visualizations of Jewish rituals and festivals, and the joyous journey of spiritual life. Flora Rosefsky: Flora began her career as a self-taught folk artist while living in upstate New York and later studied art at Syracuse University and Binghamton University. Rosefsky has exhibited her work in one woman shows as well as juried competitions and selected invitational shows. kem alexander: kem’s work has recently been purchased by the Tennessee State Museum after winning Best in Show at the 2012 TACA Best of Tennessee exhibit. Her work has shown in Chattanooga, Nashville, Birmingham and Atlanta. Jane (Sheindel) Muller: Jane is a self-taught artist and is the director of Jewish Studies at the Columbia Jewish Day School.